On Sunday, December 4, Thembanathi will again be joining other fair trade projects in Portland at First Presbyterian’s annual fair trade market. 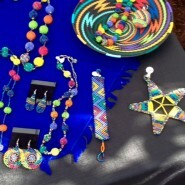 In addition to our products from South Africa, you will find unique art and gifts from Zimbabwe, Guatemala, Bangladesh, and more. All purchases at the sale benefit women and their families. The sale will be held from 10:00 am to 2:00 pm. The church is located at 1200 SW Alder Street and the sale will take place in Geneva Hall. An underground parking structure is available adjacent to the church and is free on Sundays. The door to the hall is behind the parking toll booth.